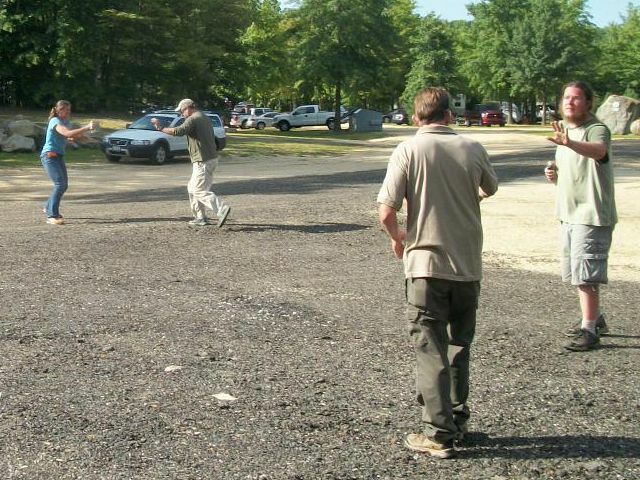 The second class I attended at Paul-E-Palooza 2 was OC and “less-lethal” for CCW folks given by Lt. Chuck Haggard of the Topeka Police Department. There was a little humor about the class title because to many attendees, ‘OC’ means Open Carry rather than Oleoresin Capsicum. As a result Chuck had to explain he was talking about pepper spray. Chuck has extensive training and experience with pepper spray. He is a National instructor for the National Law Enforcement Training Center and an Adjunct instructor for Strategos International. He has also been featured as a guest on Ballistic Radio. Chuck stated that he has been sprayed with OC about 60 times, in the training context, and has sprayed somewhere around 1000 people. Most of his sprayees are Police Cadets since his department has a mandatory exposure to OC policy for its officers. I wanted to take the class because I am a firm believer in carrying what I call ‘Intermediate Force Options.’ Pepper spray is one of those weapons that give us a response to predatory behavior not requiring deadly force. As I state in all my classes “Lacking an intermediate force option while you are armed with a firearm implies that all you are willing to do to protect yourself is kill someone.” That’s not a position most reasonable people would be comfortable in taking, given a little bit of thought. The class began with a lecture including a review of OC history, products, training and best practices. It then moved on to aspects people need to know for effective use, carry and deployment. Once the lecture was completed, the class moved into the open for practical application with inert trainers. No live weapons, ammo or OC were allowed in the practical exercises. Dummy guns and inert pepper spray canisters, which sprayed water only, were furnished. Eye protection was also furnished to the students. Once again, as at the Rangemaster Tactical Conference, I had the distinct honor and pleasure of beginning the demonstrations by spraying Chuck in the face with an inert container. We demonstrated two scenarios. In the first, Chuck began to encroach on my personal space while I attempted verbal dissuasion. When he continued to advance, I gave him a good dose and then quickly moved away while he simulated remembering a previous appointment. In the second scenario, after I sprayed him, he became irate and threatened me with a training knife. At that point, I transitioned to my dummy gun and gave him a good cowboy “Pow, pow, pow” while maneuvering away. The second scenario was especially interesting for me because I ended up with the pepper spray container in my left hand and my dummy pistol in my right. I shot one handed while maneuvering away from him. I’m not sure how things ended up that way because I started with the can in my right hand. I’m curious whether I transferred the can initially or if I did a ‘Border Shift’ with the can when I started to draw my pistol. I do remember seeing my sights while I was shooting. 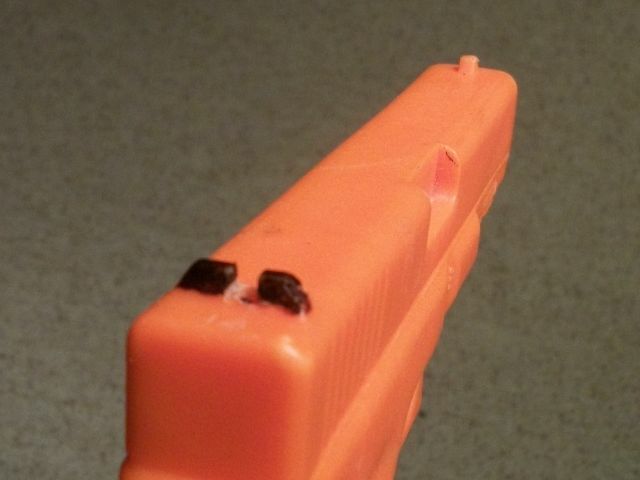 My dummy pistol has a rear sight notch cut in it because I cannot abide a pistol without sights, even a dummy pistol. After our demonstrations, the students then split up into two groups. Initially, one group played the predator while the other played the role of the defender. Then the groups switched roles. The students enacted both the non-lethal and lethal scenarios while spraying each other. The class concluded with a critique of spraying and maneuvering. I don’t practice as much as I would like with my personal OC, a Zombie Spitfire from Sabre. The class gave me a little tuneup, as well as some interesting background on the evolution of pepper spray as an Intermediate Force Option. Thanks for the assist Claude, it was very helpful. I was wondering if the inert practice canisters are available. II’ve thought about trying to affix a pocket clip to the Spitfire body so that I could carry it clipped at the top of a pocket instead. One more tool to carry. Know how to use it. Thanks for the insightful comments on the use of pepper spray. What really struck me was your comment on the use of intermediate force and what not having that intermediate force may be used to imply in legal proceedings. As a defense attorney of almost 30 years, I can assure your readers that is exactly the kind of argument some overly aggressive prosecutor or plaintiff attorney would use. Even if one doesn’t get the chance to use it, just having it can bolster one’s legal position. As for techniques for use, my thought is carrying the spray for support hand use allows use of the spray leaving the shooting free. If one needs to go further, dropping the spray while the shooting hand goes for the gun allows transition to the pistol for a two-handed presentation. Alternatively, the spray can be retained and the pistol still used with the shooting hand. I think the Spitfire device makes this option very workable because of the way it is designed. The intermediate force concept is something I wish more instructors taught. It certainly is something anyone using deadly force should know about. Could save them a lot of grief. I keep my Spitfire on my key ring so I have it in hand whenever I walk out of a building to my car. “Breathe deeply, it’s good for you.” Actually, that’s true, as Chuck pointed out in class. OC is used to treat asthma.